What Is The Best Full Coverage Foundation For Mature Skin To Look More Youthful? Home » Beauty Care » What Is The Best Full Coverage Foundation For Mature Skin To Look More Youthful? 1. What should you consider when choosing best full coverage foundation for mature skin? When you get older, your skin also ages. Don’t worry! You can still look young and feminine with a dewy skin glow because we have selected best full coverage foundation for mature skin for you. You will not need any foundations unless you are blessed with a natural beautiful smooth skin and flawless complexion. If you can’t have that, a foundation is a useful treatment to erase traces of acne, pigmentation, redness or dullness. By understanding your needs and concerns, we made a broad selection of all the products to provide you with the top foundations to conceal the sign of aging such as lines, large pores, and wrinkles. All these products are viewed to work best with your skin type and condition. The truth is that there are myriad reasons to crave for a dewy and flawless skin. A youthful and like-no-makeup skin is a sign of your feminist and youth. As our skin tends to change, the skincare and makeup products also shift to fit it routine. In this case, BEST FULL COVERAGE FOUNDATION is a good choice. What should you consider when choosing best full coverage foundation for mature skin? Once you become skilled at deciding on best full coverage foundation for mature skin, you could be your own makeup artist without relying on any makeup experts. You then do the best for your skin as you are the only one who understands your skin best. To achieve that, you need to have basic knowledge about what a mature skin is? When you age, your complexion is exposed to tons of unexpected problems. Creasing, high sensitivity to outside environment and new cosmetics products, dryness, dullness, sun damage, discoloration and extreme lack of vibrancy and elasticity are the most visible symptoms of aging skin. The older you become, the more quickly pigment cells magnify. This leads to clusters which then form age spots. The skin area, which is mostly exposed to the sun, has a high concentration of age spots. You skin tends to lose youthful glow as you age and it experiences dryness. To reach a high level of elasticity, your skin must build up strong collagen. However, skin collagen appears to be less firm when time passes. Over time, it cannot be as elastic as it used to be. Additionally, that you lose weight or gain weight suddenly can cause your skin to sag. These are possibly the most visible signs of mature skin. A healthy skin needs enough moisture to maintain its elasticity and a certain level of glow. The sad news is your skin loses moisture and collagen when you are suffering from the aging process. We can witness some certain skin areas that mostly shift such as eyes and mouth. Another cause for this involves too much sun exposure. Do not forget to use sunscreen every day to reduce the speed of forming wrinkles and lines. If your skin type is dry in your 20s, the more you age, the more dehydrated it becomes. Natural moisture that used to reside in the lower skin layer will be now inclined to lose all the natural moistures. When you get older, the reproduction cycle of your skin will stop, and the upper layers of skin are susceptible to the dry-out process as well as endure fast speed of aging. Bruises are the result of ever-weaker blood vessel. Every cell and fiber are on the tendency of losing or becoming weaker than ever. At this point of time, blood vessel walls are prone to break; thereby, triggering bruises. A mature skin is not easy to handle. Its treatment requires your persistence and attempt to find out the best formula and product that works best for your aging skin. As regards best full coverage foundation for mature skin, the tip lies in the smart selection of silicone-based formulas. This kind of formula aims at diffusing textures and helping your makeup stay put throughout the day. A proper skincare routine is also the key to healthy skin. This will make a base for smooth makeup application. Right skincare products and techniques contribute to a beautiful glow complexion and help to anti-aging process. Once you have your best skin care routine, there is no need to worry much about how difficult you have to combat headaching mature skin issues. Searching a new right makeup for mature skin should be given top priority, although it’s not happy to say goodbye to your everyday makeup products. Here, we have rounded up best full coverage foundation for mature skin. One best full coverage foundation for mature skin is Revlon ColorStay Whipped Crème Makeup from the world-known cosmetics brand Revlon. There is nothing quite like founding a perfect foundation with complete coverage to hide unexpected aging skin signs. 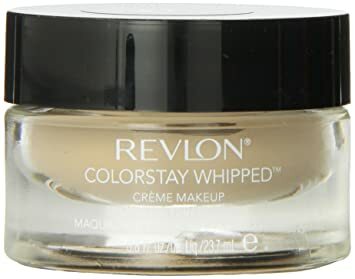 Revlon ColorStay Whipped Crème Makeup is listed as an ultimate choice for those who prefer a natural-looking finish but still look younger than the real age. With bouncy and whipped formula, the product creates a mousse-like makeup throughout the day. Moreover, it is recorded to beat the heat and stabilize your makeup to last up to 24 hours. There is a good reason why people crave for Revlon ColorStay Makeup – it contains no paraben and works best for all skin types, even the sensitive one. Hence, there is no need to worry about the breakouts caused by new makeup products. With the foundation from the brand of Revlon, your mature skin becomes younger than ever with a dewy finish. The result also contributes to control excess oil. For this reason, you could use it even in summer and on t-zones. Assessed to be the best full coverage foundation for mature skin, Revlon ColorStay Whipped Crème Makeup provides a perfect result with a nice matte finish as well as an incredible airbrushed look. If you fancy long-hour wear and durable shade, this foundation will assist you best without having to retouch. One more bonus point is that the product is affordable to buy and it is one of the most favorite drugstore makeup product of all time. Every coin has two sides and likewise Revlon ColorStay Makeup. However, the only minor thing that this kind of foundation dissatisfies customers lies in its jar packaging. To use it, you need to dip your sponge or finger into the jar. Due to this, it is not sanitary enough to apply for the next times. It Cosmetics Your Skin But Better CC+ Cream SPF 50, as its name states, not only helps to hide skin imperfections but also protects your skin against anti-aging factors like sun exposure and. It is a perfect CC cream which does not cause any bad reactions. Accompanied by SPF 50+ UVA/UVB broad-spectrum physical sunscreen, hydrating formula is another surprising benefit of It Cosmetics Your Skin But Better CC+ Cream SPF 50. It nourishes your skin and participates in the process of correcting skin color and protect the collagen system. There is one more important reason to explain why this is the best full coverage foundation for mature skin. It involves the possession of ingredients that are strongly believed to possess golden treasures such as anti-aging peptides, essential nutrients and vitamins to nourish your skin. All of these ingredients are what a mature needs. Besides, the product features an advanced anti-aging serum which is infused with peptides, niacin, antioxidants, hydrolyzed collagen, hyaluronic acid and multiple types of vitamins such as vitamin A, B, C and E. It is to say, these abundant skin nutrients foster a more radiant complexion. Then, you will find no trace of wrinkles, pores, and lines. Do not hesitate to try one and you will be taken aback by its fantastic coverage and great effects it brings to your skin. It Cosmetics Your Skin But Better CC+ Cream SPF 50 is best recommended for mature and sensitive skin. You can apply easily and evenly. There are proven results that this best full coverage foundation for mature skin brings out such as smooth and matte finish, good pigmentation and long wear throughout the day. With just one jar of foundation, you have a chance to discover 7 products all in one. 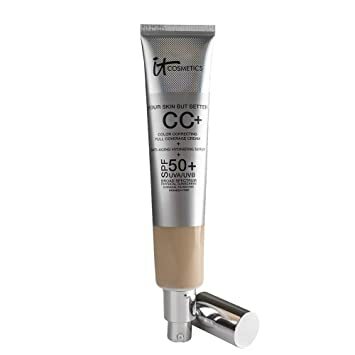 This amazing CC+ Cream SPF 50 not only provides full coverage but also is a day cream supplying enough moisturizer, a primer to diminish large pores, a useful sunscreen, a concealer to hide imperfections, a color corrector to make your skin brighter day by day and a serum with ability to defend your skin from aging factors. For such a good foundation, it is quite pricey. Despite positive effects it has on our skin, the foundation seems not to stay for too long. Also, it is a little greasy. 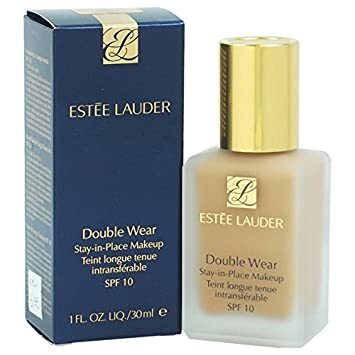 Another not-to-be-missed drugstore makeup product that would please anyone who is extremely concerned about aging with full coverage. Besides its ability to cover redness, wrinkles, and large pores well, it could do more than things a foundation can. Maybelline New York Instant Age Rewind Radiant Firming Makeup is claimed to do a good job in creating a better and more natural highlighting and contouring. The foundation has everything that you need. Whether you require a full coverage, not greasy and SPF to prevent your skin from getting burned, coupled with the ability to seven skin tone, New York Instant Rewind will exceed your initial expectation. When it comes to assisting your mature skin, the goji berry and caffeine included in the ingredients enhances the skin elasticity and SPF 18 defends your complexion from lines and wrinkles. You could get the best makeup result by using this best full coverage foundation for mature skin. Try it to look more youthful. With Maybelline New York Instant Age Rewind Radiant Firming Makeup, a radiant firming makeup, a glow and smooth skin tone, better skin complexion and good sunscreen – all are you can get after choosing it to be your makeup product. For sure, a mature skin needs it. Regardless of having acne, fine lines or blemishes, it still does an excellent job without leaving behind a caked finish. How long the foundation can last mostly depends on your skin conditions and the application technique. There is one thing that some do not like this foundation. While some revealed that it could last almost all day, others claimed that it can stay put only by retouching it for the second time or use it with powder. Whether it lasts for long or not, you are advised to establish a healthy and right skincare routine. A skin with enough moisture will help your makeup application become more radiant and easier than ever. Makeup specialists often advise not to apply heavy foundation. However, the thing is you need a type that could hide your aging signs well. We’ve got another incredible winner for you. L’Oréal Paris Visible Lift Serum Absolute Foundation will be among your best full coverage foundation for mature skin. It is a makeup foundation hat love your mature skin so much. No matter how aging your mature skin is, L’Oréal Paris is here to help you get a desirable finish. The foundation contains essential ingredients that a mature skin needs. Unlike some other foundations that they can only achieve a full coverage and a flawless complexion by heavily applying layers. L’Oréal Paris Visible Lift Serum Absolute Foundation outstands in this aspect. You will be a pro in makeup because with easy steps, this product evidently minimizes unanticipated wrinkles, lines and even large pores. Consequently, a smooth and even skin tone are astonishing results that a foundation treats your skin. You must have aware of the fact that you should never make your skin dehydrated. If you do this, your skin experiences unforeseeable aging process with a light speed. To have a healthy skin, feed it with skincare products that make it hydrated all the time. By knowing this truth, L’Oréal Paris Visible Lift Serum Absolute Foundation is designed with a function to instantly hydrate your skin; and thus, even tone. Revitalize your skin and defend it against discoloration, wrinkles and lines by doing makeup with best full coverage foundation for mature skin. These are things this foundation type might help you. The truth is that it contains pro-Retinol A and Vitamin C – two golden anti-aging keys to your skin. To understand how L’Oréal Paris helps you in this case, you need to know how vital retinol and vitamin C are. According to experts, by peeling off dead skin and building collagen for skin with the use of serum and cream, you can get a radiant and elastic youthful skin. The best way to treat your skin well is to use retinol and vitamin which are very helpful in preventing wrinkles and aging signs. As we all know, collagen is a proof of a healthy skin. Retinol A and vitamin C significantly support collagen because as previously mentioned, they eliminate outer skin, also known as dead skin. This process helps deeper skin construct stronger collagen, fibers and become more active to protect the skin against the bad environment. By the same token, these two substances can easily penetrate into the deeper skin to repair damages and stimulate the production of new fibers and stronger collagen. If you use retinol A and vitamin C appropriately, your skin becomes more and more elastic and much less vulnerable to any damages. Hence, they are likely to fight wrinkles, lines, large pores and protect the skin from sun damage. Now, you might be aware of how important retinol A and vitamin C to your skin health. After knowing that, there is a high likelihood that L’Oréal Paris Visible Lift Serum Absolute Foundation will be one of your considerations when selecting a right foundation for your skin. Besides good effects involving conceal imperfections of skin texture, L’Oréal Paris also brings about positive long-term results for a future better and stronger skin. L’Oréal Paris is regarded as a breakthrough in miracle makeup for mature skin. In addition to anti-aging ingredients, the product is infused with SPF 17 which creates a protection from sun exposure. There are specific statistics to prove how effective this foundation brings about. At a reasonable price, L’Oréal Paris Visible Lift Serum Absolute Foundation can do more than its real value. After weeks of use, you get a smoother and brighter skin. It is recorded that up to 87% witnessed an even skin tone, nearly 70% saw the considerable reduction of wrinkles and lines, over 80% had a more radiant and glowing skin and up to 90% noticed minimized imperfections. There are complaints about the built-in brush; therefore, you are supposed to use a foundation brush or a foam sponge, instead of the brush for easier application. Everyone must be familiar with this foundation from the world-known brand. Double Wear Stay-In-Place Makeup SPF 10 offers the best experience for those who fancy makeup. For those who are getting into trouble with aging factors, it is the best full coverage foundation for mature skin to help you retrieve your youthful look. Characterized as a long-lasting foundation with matte finish even those with oily skin, it could probably keep undesirable imperfection resided throughout the day. You can enjoy a full coverage and look younger than your real age. Whether it’s a summer day or extremely high temperature, your makeup still stays put without re-touching. If you prefer a natural looking and feminine makeup style, it is a must-try because you don’t need to set ay powder. With only a layer of foundation, you can both minimize imperfections of a mature skin and has a natural dewy finish. Moreover, it is so lightweight that you feel like you are not wearing makeup. In short, it is worth every penny. Good news! The product is non-acnegenic and non-fragrance. As a result, it causes no allergic reactions and makes your makeup stay in place all the day even you participate in nonstop activities. There is one thing to remember when you do makeup with this product. As it is a long wear foundation, you should remove it with exclusive makeup remover to ensure a completely clean skin before going to sleep. You can’t skip this step or else you many get into trouble with acne and some unexpected skin issues. Double Wear Stay-In-Place Makeup SPF 10 blesses us with a long-stay as well as natural-looking finish. With a lightweight and oil-free formula, your skin always looks fresh like no makeup and stay the original color until the end of the day. As the article described above, this type of foundation is long wear, so it is quite difficult to remove. Once you know that, there exists no hindrance for you. Remember to make your skin clean enough before going to sleep. Just like how we modify our skincare routine when we age, the same applies to our makeup products, too. We cannot use the same routine when we’re in the 20s as when we’re 40s. Everything needs changing. You sometimes can be your own makeup artists with some genius tricks involving how to choose foundations that fit your skin best. Now, there is no need to worry about your mature skin anymore, our selection of top five best foundations will be like a journey back in time to help you look youthful as always. Of course, do not take any hesitation to master our above tricks of best full coverage foundation for mature skin. Once you are good at it, you can do by yourself and have a perfect makeup for all day long.